Event Update – Entries Are Live! 6 PERSON RELAY NOW AN INTEGRAL PART OF THE EVENT! Kia ora all potential runners/walkers and interested parties. This is event update 2 as we are about two months out from event date. There will probably be 2 more updates between now and event day (Sun 18th June). Please pass on this info to anyone else who may be interested! Registration: We now have, on the website, a (hopefully) simple online process for registration. Huge thanks to Harrison Dean and Harness Communications (harness.kiwi) for making this possible! The process is straightforward and includes making a voluntary donation to either, or both, of our chosen charities as your entry fee (The Mental Health Foundation or The Heart of Biking Cycle Trust). Secure donations can be made by credit/debit card via links on the website. If you don’t have a credit card then you can simply make a manual/cash donation into the collection tin when picking up your race number the day before the event or at the event itself! The registration process asks for your name, your gender, and the event you have entered (i.e. marathon, 2 person marathon relay, or the 6 person relay). In the case of the 2 person relay team then the details for ‘both’ of you will be asked for &, in the case of the 6 person relay team, the details of the ‘team captain’ & all the other team members will be asked for. For all events you will be asked to give your estimated time for completion. If your honestly estimated time for yourself, or your team, is over 4 hrs for completion you can indicate if you want an early start. For each solo marathoner, or relay team of 2 or 6, you will be asked to give an emergency contact person and their phone number for event day (you never know?). For the solo ‘full marathon only’ you will indicate if you are a first time marathoner. As a simple, low-key, event categories the only categories remain as Male/ Female for the marathon run, & ‘mixed’ category for everything else (marathon walk, & relays) simple as that, regardless of age…You know how old you are and how you have compared with your similarly aged peers! At this stage the number of entrants to events is not limited! NB Just because you enter as a runner doesn’t mean you can’t walk a bit as need be! Marathon Relay (i.e. 2 person team, tag at at Rabbit Is. Change shed) Note: leg 1= 23km, leg 2 = 19km. You can enter the relay Either as a RUN team (i.e. where at least one of the team members runs at least some of the way) or WALK team (i.e. where both the team must walk ‘all the way’!). Relay teams will not be differentiated by gender or age so mixed teams (1 male, 1 female) are encouraged for fairness! 6 person relay: From this year we are proud to include the 6 person relay as an integral part of the event! The 6 person relay is supported by Waimea Harriers & is open to all; you do not have to be a club member of any kind! Please note that, in order to enter this event, you must have your whole team pre-arranged, although team members can run more than 1 leg as needed,…or as they want? & changes to team members can be made (& notified to event organisers). The legs are varying distances (from around 5 km to around 9 km) with the change over point being at drink stations. Approximate distances given below! 6 person relay teams will need to keep their own split times for each leg if they want a record of them. Team times at Rabbit Is, & at the finish, will be recorded/taken by organisers. Drink/aid stations: Largely these remain the same as the previous 3 years being approx every 5-6 kms. The locations of drink stations are- 1: Adjacent to the Honest Lawyer when returning from a lap of the Monaco peninsular (4km), 2: adjacent to the camper van car park at the end of Fittal St (off Beach Rd) RMD, (9 km). 3. Lower Queen St/Speedway Corner 15.5 km 4. Redwood Rd crossing 19.5 km 5. Rabbit Island beachfront 23km.Then on the return 6. 26 km (Redwood Rd crossing), 7. 30 km (Lower Queen St/Speedway Corner), 8. 36.5 km (Camper van park). Drink stations will be water only with the exception of Rabbit Island (approx 23 km) that will also serve an electrolyte drink, most likely Replace & will also have lollies available. It has also become a feature of the event that all participants donate a spot prize for the prize table. Pretty much anything goes! So drop in a spot prize of some kind when you pick up your race number or, pass them on to me (Stu Cottam) beforehand if you know you’ll see me around! 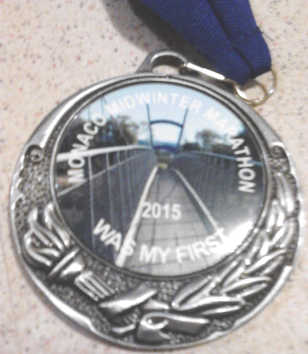 First time marathoners: You are particularly welcome as a first time marathoner and will receive a commemorative medal if you complete the distance (see inset image). Your first time is a big deal!! All solo marathoners who complete the distance (running or walking) will receive a commemorative certificate! 8 a.m. for all Full marathon ‘walkers’ & 2 person marathon ‘walking’ teams (+ for those who have requested it during the registration process!’) i.e. 4 hr+ marathoners. 2 person relay: If you are running/ walking the first half of the relay (from Monaco to Rabbit Is.) you must arrange your own transport back. Most likely the vehicle team member 2 has used to get to Rabbit Is. will be your transport back? Team member 2: Please be mindful of leaving for Rabbit Is. In plenty of time for change over & driving/ parking considerately so as not to get in the way of participants at the change over point! This point is ‘over half way’ for the first relay runner (i.e. the first runner/ walker will do about 23km & the 2ndrunner/walker around 19km) we will mark the half way point so you can take your time there if you want, it just makes more sense to do the changeover at the change sheds! 6 person relay: Just 1 support vehicle per team please to avoid congestion, & park considerately ‘off’ the course (i.e. not on the cycle trail or in front of trail to road exits). Please be mindful of dropping off the next leg walker/runner in plenty of time for change over! Warm up events: Below are a few, suggested, local (ish) events to consider having a crack at along the way to building up for your marathon. Many of these events are organised by Athletics Nelson or Waimea Harriers & are open to all. Sometimes a small entry fee may apply. Times for events may change but Saturday events usually start at 2.30pm. Please check on their website though! A run/walk of approximately 14.5km starting at the Belgrove Tavern through Tunnel & return. You can compete as an individual or as a 2 person team (1 up & 1 down). $5 entry fee per person, enter on the day, spot prizes afterwards. 2.00pm for early runners and walkers 2.30pm runners. The tunnel is 1352 meters long and very dark so ALL competitors must carry a light which will be compulsory for safety reasons (torch or headlamp). Sat 29th April 2.30 p.m. Sprig & Fern 10km walk/run, Richmond . Enter on the day! Sun May 14th the Takaka Hill Run (free event & hosted by Athletics NN) just turn up & do it! Approx 15km…..UPHILL! Trophies will be awarded to the first male and first female marathoners & the winning 6 person relay team. Small prizes and medals will be awarded to the first 3 men and women marathoners, and the first 3 run and walk relay teams (2 person & 6 person), regardless of gender. Spot prizes will be randomly drawn throughout prize giving with spot prizes having been donated by participants and, we hope, a couple of major spot prizes can be drawn at the end! It is hoped to be completed by 4 p.m.
Food by payment: By popular demand, & supplied by the Honest Lawyer, we will again have a ‘limited’ supply of hot soup of rolls available at the finish for a $5 donation to cover costs! Only for participants please! Well, that’s about it for now! We will put out more race info. Via the website closer to the date! Please also check in with the event Facebook page for any updates!